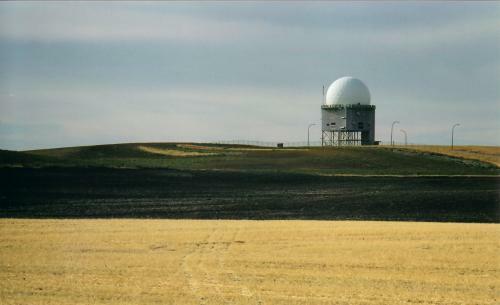 The Alsask Radar Dome was a part of what was known as the Pine Tree Line, a Cold War era network of military radar stations jointly operated by the Canadian and American governments to monitor Soviet activity in North American airspace. The golf ball shaped fibreglass dome was designed to shield the radar array inside from inclement weather. It surmounts a two-level tower raised on steel beams: the first floor contained transmitter equipment; the second housed receiver-associated equipment. A computer, control centre, and administration offices were located in a separate building at the radar site. During the early years of operation the site also had two height finder radars located on either side of the search tower. Village, pop 178, located just inside the Alberta-Saskatchewan border, W of Kindersley on Hwy 7. Settlement of the district began around 1909, and by 1916 the population was over 300. The 1930s hit the region hard, however, and by World War II the town had lost a third of its citizens. In 1959, the village’s fortunes changed when RCAF Station Alsask was conceived as part of an early warning radar system deemed integral to North American air defence against Soviet missiles and bombers. Construction of the 418-acre military facility adjacent to the north side of the village began in 1961, and in early 1963 the long-range radar unit, 44 Radar Squadron, was operational. The station later became known as CFD (Canadian Forces Detachment) Alsask. The base included three radar domes, housing, a school, a swimming pool, and the first cable television in the province. It was staffed by 125 service personnel, many of whom lived on site with their families, as well as 60 civilian employees. The village of Alsask was transformed by the activity and the combined population was over 800 in the early 1970s. The disbanding of the station in 1987 had a major impact on Alsask, as hundreds of people were gone within months. Few businesses remain in the community today. The one remaining radar dome, built in 1961, was designated a heritage property in 2002. Today, agriculture as well as and oil and gas are the major industries in the area.